The Montessori School of Holmes Run first opened in 1973, as a response to parent interest in a community-oriented, child-centered learning opportunity. The Montessori School of Holmes Run provides a Montessori education for children between the ages of 2.5 – 6, including Kindergarten in Falls Church, VA and serve families and their children from Vienna, Annandale, Springfield, Fairfax, Arlington, McLean, Alexandria, and Reston. 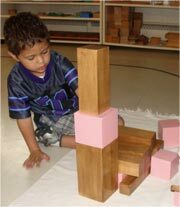 At the Montessori School of Holmes Run, we have created environments rich in materials and broad in the curriculum. Our classrooms are led by certified Montessori teachers, whose goal is to help each child achieve his or her own potential. In keeping with the ideas of Dr. Montessori, our developmental approach allows each child to learn at his or her own pace. The wide variety of cognitive materials and a prepared environment foster learning in all areas, and with multi-age classrooms, children at various stages of development can learn from and with each other. We are dedicated to providing a safe, nurturing and stimulating environment for your child. Our schools focus on developing a supportive and dedicated community in which students can thrive and grow academically, socially, and physically. Students are given opportunities to share their special gifts and skills with the community at large, through presentations, parent nights, performances and fairs. MSHR students display a strong commitment to the larger community of which we are apart, raising money for various causes and donating their time and efforts towards helping those in need. Our students also expand their knowledge through the opportunities within the community. Our proximity to the diverse offerings of this area allows us to provide monthly field trips during the kindergarten year. By exploring the museums, centers, and parks children are encouraged to apply their classroom lessons to the world around them. We encourage you to visit us and learn more about the variety of opportunities available to your child at the Montessori School of Holmes Run!